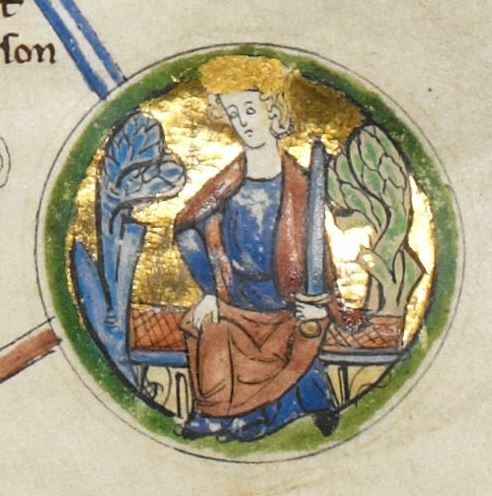 Edmund was King of the English from 23 April to 30 November 1016. He was the son of King Æthelred the Unready and his first wife, Ælfgifu of York. He was not expected to be King of England; however, by 1014 two elder brothers had died, making him the oldest male heir. His father, Æthelred, was usurped by Sweyn Forkbeard in that same year, but Sweyn died shortly thereafter, paving the way for Æthelred and his family to return to the throne, which they did but not without opposition. Edmund's reign was marred by a war he had inherited from his father, his cognomen "Ironside" was given to him "because of his valour" in resisting the Danish invasion led by Cnut the Great. It was not until the summer of 1016 that any serious fighting was done: Edmund fought five battles against the Danes, ending in his defeat on 18 October at the Battle of Assandun, after which they agreed to divide the kingdom, Edmund taking Wessex and Cnut the rest of the country. Edmund died shortly afterwards on 30 November, leaving two sons, Edward and Edmund; however, Cnut became the king of all England, and exiled the remaining members of Edmund's family.